Ah the joys of spring, warm sunshine, snow melting from the hills, time to put the winter gear away and look out the lighter boots. What do you mean am I taking crampons and ice axe this weekend?! A quick look at the webcams and it looked like January with snow down to about 400m and summit temperatures of well below freezing forecast for the Saturday and Sunday. So out come the winter togs again. On Saturday we split into 4 camps, Wyvis, An Teallach, Beinn a Chasteil and the Deargs. 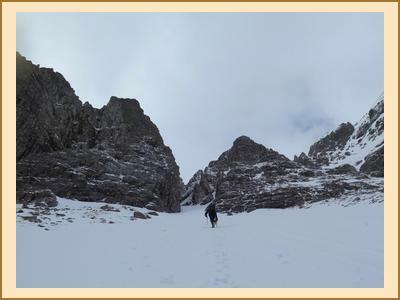 Paul, Tim, Kenny and Alison headed for An Teallach and went up the soft snow in Hayfork Gully with Alison top bagging and Paul adding to his Munro tally. Fiona, Margaret, Nigel and Gordon headed for nearby Ben Wyvis with Nigel jumping in his car afterwards and heading down the destitution road to bag some Marilyn. Cathy and Nathalie stayed very local and bagged the nearby Corbett Beinn a Chasteil. Meanwhile Elsie, Martin and myself had grand plans of a long run over the Deargs and back to the bunkhouse, this notion didn't last too long however as once we passed Allan, Kate and Emma and had to break trail ourselves and I sank in to the snow past my waist on the way out to Seana Bhraigh we quickly abandoned that plan and made do with the 4 munros next to Beinn Dearg. Allan, Kate and Emma were however made of much sterner stuff and were not to be defeated. As with all big summits Kate had stipulated a turnaround time should they not have reached the summit of Seana Bhraigh by the allotted hour, this didn't prove necessary however and the top was reached in good time. After the shock of Cathy being only the 3rd person into the kitchen on Sunday morning (independent witnesses verified this unique event) normality was restored and despite the weather at the bunkhouse being pretty dreich plans were hatched. Cul Mor, the Fannichs, the Strathconon corbetts were all dispatched while I was top bagging on Ben More Assynt. 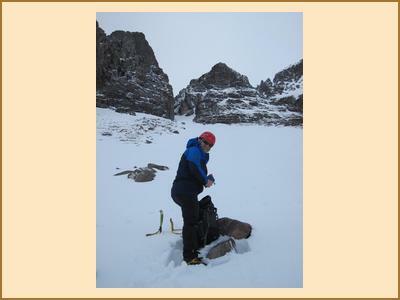 Kate, Enma, Allan, Paul and myself stayed on for a further night with Paul and I both heading up Wyvis in some pretty challenging conditions at times and Kate, Emma and Allan adding to the Corbett tally down Strathconon. This was the first time the club has stayed at Aultguish in many years and it proved to be a very good bunkhouse and great central location for a wide choice of hills. A footnote to this is that a week later the temperature in Ullapool was 24c!